Do you know that every cell in your body has almost six feet of DNA? The diameter of the largest human cell is just about the width of a hair. Is that thing amazing? Are you interested in how does all that DNA fit inside a cell without spikes of DNA sticking out all over? Yeah, the answer is histones. Upon the DNA is wrapped around histones, it will be shortened to 0.09 millimeters. In this article, we focus on the definition of histone, its classification based on different functions and the structure of nucleosome. Histones refer to any of various simple water-soluble proteins that are rich in the basic amino acids lysine and arginine and are complex with DNA in the nucleosomes of eukaryotic chromatin, also known as alkaline (basic pH) proteins. They are found inside the nucleus of eukaryotic cells. 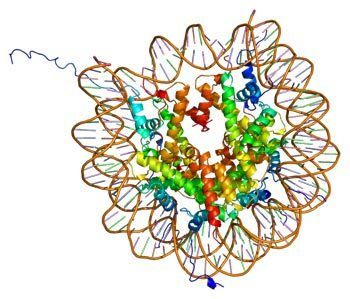 Their function is to package DNA into structural units called nucleosomes. Histones are the main proteins in chromatin. Chromatin is a combination of DNA and protein which makes up the contents of a cell nucleus. Because DNA wraps around histones, they also play a role in gene regulation. There are five families of histones (H1 through H5). Based on different function, they are divided into two groups. One group is core histone, involving H2A, H2B, H3, and H4. Another is linker histones, including H1 and H5. The core histones form the center of the nucleosome, hence the term 'core'. The linker histones are found at the entrance and exit sites of the nucleosome and lock the DNA in place, hence the term 'linker'. The core histones include H2A, H2B, H3, and H4, and all of them exist as dimers, which are similar in that they all possess the histone fold domain: three alpha helices linked by two loops. It is this helical structure that allows for interaction between distinct dimers, particularly in a head-tail fashion (also called the handshake motif), as the figure 1 shows. Because of the feature of interaction between distinct dimers, the four distinct dimers can come together to form one octameric nucleosome core. In addition to the core histones, there is another type of histone that known as linker histone, including H1 and H5 (in avian species). The linker histones present in all multicellular eukaryotes are the most divergent group of histones, with numerous cell type- and stage-specific variant. Linker histone H1 is an essential component of chromatin structure. H1 links nucleosomes into higher order structures. Histone H5 performs the same function as histone H1, and replaces H1 in certain cells. The linker histones are critical to the higher-order compaction of chromatin, because they bind to inter-nucleosomal DNA and facilitate interactions between individual nucleosomes. As you know, core Histones form dimers and tetramers, dimers have two histones, and tetramers have four histones. Each nucleosome has two identical dimers, each comprised of one H2A and one H2B histone. This is called a H2A-H2B dimer. 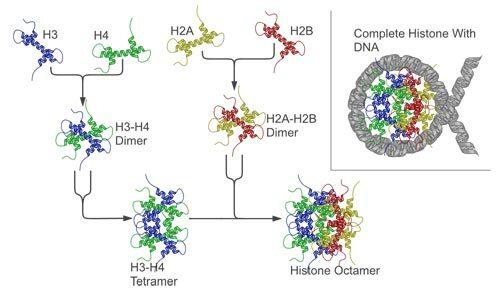 Additionally, each nucleosome also has one tetramer comprised of two H3 and two H4 histones. This is then called a H3-H4 tetramer. Then the two tetramers and DNA form a nucleosome. As the figure 2 shows. A strand of DNA will wrap around the core histones 1.65 times. Interactions between nucleosomes allow for higher-order structures to form. The linker histone H1 binds the nucleosome at the entry and exit sites of the DNA, thus locking the DNA into place and allowing the formation of higher order structure. These higher-order structures can condense the chromatin to the point where chromosomes form. Chromosomes are found in the nucleus and contain genes. The familiar shape of a chromosome is that of an X. It is histones that make this familiar structure possible. Here, we list part of CUSABIO Histone antibodies products, as the Table 1 shows.